Rated 5/5: "I like fantasy and it is also kinda funny with funny illustrations". Zoe reviewed the same book as last month, but talked about the chapter she has just read. The adventure continues of the magical wishing chair that has wings and flies Peter, Mollie and Chinky the pixie everywhere. This time it’s to the village of The Slipperies, who are cheeky and trick you. Rated 5/5: "I like it because it is adventurous." Locked in : bk. 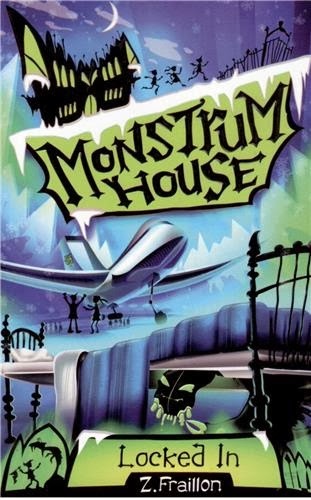 1, Monstrum House series by Z. Faillon - reviewed by Alex G.
Jasper McPhee has been expelled from school because he is naughty, and is sent to The Monstrum House School for Troubled Children. This is no ordinary military school. Teachers seem to be able to read minds, but he thinks they’re 'cuckoo'. Lessons are all about hunting monsters and being hunted. There are also characters like the 'Thug Brigade', who are guards that have no brains (literally), and the Snobbleshriek, who hides under the bed and can scare you to death, and Bogglemorph, who can change into different people! Rated 5/5: "It is the second time I’ve read this book. I’ve enjoyed it even more this time, as there are more things to discover that I didn’t notice the first time. It’s a cool book!" This is based on the classic E. Nesbit book 'Five Children and It'. Basically 4 children are brought together as Dad has remarried. They go for a picnic in the woods and whilst digging in the sandpit discover a magical sand fairy. On the discovery of 'It', wishes are granted every day to the children when they visit. This magical creature brings the family together and they realise they can get along in the end. Rated 4/5: "It was interesting... it's based on a classic but with a twist." Paulina gets a call from her home in Peru saying that her archaeologist friend is missing and so the Thea Sisters go to Peru to solve the mystery. They travel up the Andes Mountains. They are scared of a bird (condor), which the whole village is scared of, that blocks their path... they find out that the 'condor' is a machine and they also discover a secret city and door, which leads to the treasure of the city! Rated 5/5: "I love how the Thea Sisters have great adventures!" At this point the group had fun trying to spell out the word 'ARCHAEOLOGIST'. The 39-storey treehouse by Andy Griffiths - reviewed by Alex W.
The book has 13 fun stories, with 13 new levels to read about. It continues from the the '26-storey treehouse' and the '13-storey treehouse'. It has a 'once upon a time machine', a boxing elephant called the Trunkinator, and one storey (the 39th) level that has not been finished yet! Rated 4/5: "I liked the two characters Terry and Andy. Terry is relaxed and Andy is always stressed out. I enjoyed reading about their funny adventures." Geronimo Stilton has a crush on Petunia Pretty Paws. He has asked her on a date on valentine’s day. He’s hired a tuxedo and a fancy car. Geronimo is late, as a fish has been dropped on his head, he has stepped on a banana peel and he has ripped his pants. So not only does he smell bad, but he is very late for his date! His friend Hercule Poirat has called, as he has a cheesecake mystery to solve and he needs his help to find the most famous painting in New Mouse City (of the first chocolate cheesecake). The richest person in the city has the painting... and along the way Geronimo has to test 100 cheesecakes. He forgets it’s his birthday, and a very special cake is given to him... guess what it is? It’s a giant cheesecake (oh no!).. He gets to share it with his love, Petunia, at the end. Rated 5/5: "I like Geronimo Stilton and this one as it’s romantic. I like this series as it has lots of adventures."